Just like a real Vespa but smaller and approved by Piaggio & C. S.p.A. The electric motor bike that works on a 12 Volt rechargeable battery for children aged 3 years up. Designed for Vespa fans and for those who love classy bikes The Peg Perego Vespa is the faithful reproduction of the mythical Vespa down to the smallest detail. Available in unisex colours with amazing chrome details. Just like a real Vespa but smaller and approved by Piaggio & C. S.p.A. The electric motor bike that works on a 12 Volt rechargeable battery for children aged 3 years up. Designed for Vespa fans and for those who love classy bikes The Peg Perego Vespa is the faithful reproduction of the mythical Vespa down to the smallest detail. Available in unisex colours with amazing chrome details. Just like a real Vespa but smaller and approved by Piaggio & C. S.p.A. The electric motor bike that works on a 12 Volt rechargeable battery for children aged 3 years up. 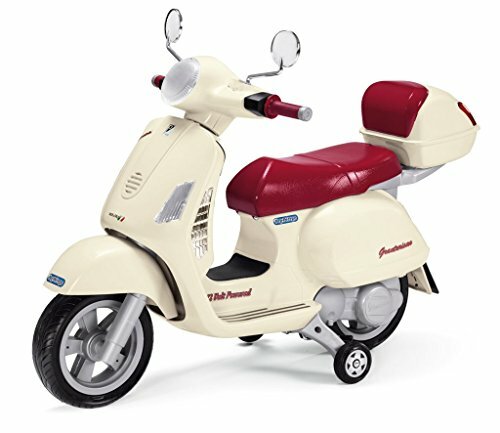 Designed for Vespa fans and for those who love classy bikes The Peg Perego Vespa is the faithful reproduction of the mythical Vespa down to the smallest detail. Available in unisex colours with amazing chrome details. Many details that add up to complete comfort such as the large and cosy seat, the rear object holder that also functions as a back rest that can be removed to leave space for a strong baggage rack. A large footrest accommodates any driving style. The look of the stabiliser wheels fits perfectly with the design. They are perfect for small children who are still a little unsteady and can be removed when the child has acquired the necessary balance. The rubber tyres offer the utmost adherence and the large mudguards protect from spray. The iron kickstand is very strong and durable. The headlights are all reflective.